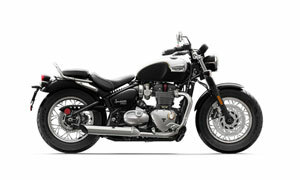 One only #224827^^THE ALL NEW BONNEVILLE SPEEDMASTER brings a new dimension to the Bonneville line-up. With much more classic British custom laid-back attitude, forward footpegs, swept-back beach bars and comfortable pillion capability, the new Speedmaster delivers a distinctive cruiser riding style.^^Offer ends 30/04/19^^Please note this price is for Queensland only. This price may not include all features and colour options. Please contact your local Triumph dealer for location specific pricing.^^*Ride away price includes all offers, cashback, rebates and discounts.